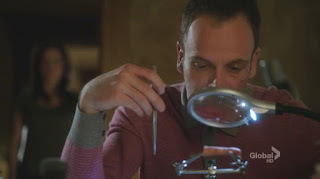 Da Couch Tomato: Elementary. Episode 15: "A Giant Gun, Filled With Drugs"
Another literary reference: Sherlock’s drug use, which he does to induce him to a presumably altered state, which in turn gives him the out-of-the-box ideas he needs to solve his cases. John Hannah’s presence has tested Sherlock’s self-control as well as their friendship, and Holmes did a great job coming out on top. "You know what, Hannah? The Mummy Returns sucked!"